Requirements: Any IBM PC, XT, AT, Personal System/2, or compatible with at least 256K; runs with EGA, CGA, or Hercules graphics cards. The game includes an option that permits play via modem (1200 baud) or between linked computers. To date, the best helicopter simulators have placed an emphasis on accuracy in the control panel and the flight controls of the craft (within home computer limitations), while getting by with a landscape that can at best be considered generic. 3-D Helicopter Simulator from Sierra turns that trend around by providing you with a generic helicopter, while taking pains to give you authentic landscapes over which to fly and fight. There is both good and bad in this approach; I'll try to take the features one at a time. Since they did not opt for a catchy title like Gunhawk, Whirlybird, or Rotary Death, I assume that the scenery and the ability to share airspace via a modem link were always foremost in the minds of the creators. The helicopter itself is almost an afterthought. No matter, for it lifts into the air and goes places, and that is about all you need. You fly over scenic places that are as good as the views in Microsoft's Flight Simulator—perhaps even better in some instances, for the 3-D objects are solid rather than wire-frame. Seattle's Space Needle is convincing, and Los Angeles, seems shrouded in smog. Further, note that a good part of the excitement in the movie Blue Thunder was generated by deadly helicopter battles taking place over a major city, and some of that same excitement is present in Helicopter. Because the scenery in some flight areas is denser than in others—thus causing a slower screen updating—these areas are indicated on the menu, with an asterisk. The idea is that you should fly these skies at your computer's "turbo" speed or be prepared for a slow flight. This is good thinking on the part of Sierra, and I wish other producers of simulators would do the same. Other scenery areas include Spaceport U.S.A. (where I blew up the Vehicle Assembly Building), Houston, Port City, Yosemite, and Farmland. The first three are dense scenery areas. If you're going to try to emulate Blue Thunder, I'd recommend you do it in Houston or Port City, both of which consist of half a dozen buildings. Farmland is mostly trees and a heliport; Yosemite is two mountains and a heliport; and Los Angeles is two or three buildings near the airport. 3-D Helicopter Simulator offers head-to-head competition via modem. Though the structures are solid 3-D graphics, the documentation states that certain compromises in programming make it possible to fly through some of these structures, but not all of them. Make it a point to fly around everything. Control of the craft is by keyboard or by a combination of keyboard and joystick. Pushing the N and M keys controls ascending and descending, and your joystick or numeric keypad controls the direction of movement. Because the Helicopter is generic and follows no set form, your armament consists of 60 unspecified missiles. Since I consistently have destroyed buildings and only occasionally destroyed an enemy chopper, I'm pretty sure these missiles are unguided, as well as unspecified. Press the space bar, and you'll see a black triangle moving out from your ship. When it impacts with something, there is a soundless explosion that is indicated by multiple crosses, somewhat like stylized fracture lines. Since combat is one of the main reasons for having the program, I wish these routines had been better realized. In combat, you can contend against the computer or against a friend on another computer. 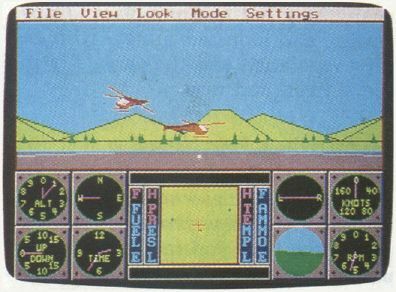 A main feature of Helicopter is the head-to-head combat against friends who are connected to you by modem and who also own a copy of the program (though it isn't necessary they have the same computer). I can see where this could be a lot of fun, especially when playing tag among the canyons of a city, but with combat routines that are both slow (even at turbo speed) and noiseless, quite a bit is left to be desired. There is also more to be desired in the way of graphics. As noted above, the scenery is impressive, the control panel is well done and easy to read, but the aircraft graphics are disappointing. By switching views, you can watch yourself fly from Ground, Tracking, or Satellite viewpoints, but there really seems little point in doing this. All you will see is a box with what might be an attached rotor. The numeric keypad provides cockpit views in eight directions, and this is one of the niceties of 3-D scenery. When you fly past a building, you can switch to a rear view and see it receding in the distance. Further, since all objects on the console radar screen are white blocks, switching viewpoints tells you whether an object is a building or an enemy chopper. In summation, I think the chief excitement of 3-D Helicopter is the ability to strategically use solid structures for evasion and concealment during combat, either against the computer or against a friend on the other end of a modem link. The trade-off for the scenery is a reduced speed in screen updating, thus slowing the apparent speed of the helicopter and making the movement somewhat choppy. Though the sound is less than satisfactory and the shapes of the choppers anything but aerodynamic, I realize some of this is due to the limitations of the PC itself and not to shortcuts in programming. Documentation is good and complete without being overbearing, and there is a rather large quick-reference card to help you sort out the many keyboard commands. Most of these have to do with invoking options rather than controlling the craft. 3-D Helicopter Simulator runs on the IBM PC and PCjr, as well as Tandy and other MS-DOS computers with 256K or more. It supports CGA, EGA, or Hercules graphics cards, can be installed on a hard disk (though the floppy will be required as a key disk during booting), and also supports 100-percent Hayes-compatible modems. As currently available, the package contains both a 5¼-inch and a 3½-inch disk.